This graphic gives you an idea of the island's location relative to our state, and the rout taken by the ferry boat. We need to board the ferry by 9:30 AM on Saturday. It takes us back off the island at 4:00 PM on Monday. 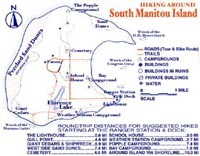 You can see that the boat also visits North Manitou Island. That island does have people living on it. We will not be visiting that island. 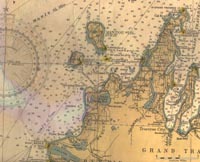 This is a nautical chart. It shows water depth, among other things. Of course, water levels change from year to year. But you can see that the deep water is between the island and the Michigan beach. The South Manitou Island deep water bay made it an attractive destination for boats that found themselves in a sudden storm. Fifty sunken boats now surround the island. This is a map of the island's campgrounds. We are staying at the "Bay" campground, which is about a mile hike from the boat dock. We expect to hike and explore the entire island. This will take time away from the radio operation, but has to be done.